Opened in 1971, Mission Bay was the first “double-wide” mobilehome community in Alameda County. This San Leandro-based community features a distinctive early California/Spanish-style architecture. 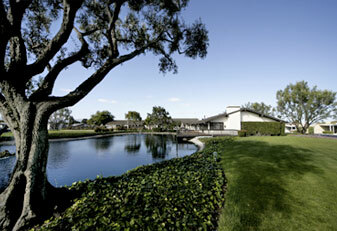 The clubhouse is set behind a large grassy area accented by a pond graced with fountains. Mission Bay is a 366-space community for older persons in accordance with federal law. This means that at least one person in a prospective tenant’s household must be 55 or older, and no person under the age of 18 may reside in the community. The Mission Bay residents, many of whom have lived there for decades, have a deep pride in their community as evidenced by their nicely maintained homes and yards. In addition, the residents maintain a very active slate of activities in the clubhouse and common areas such as morning coffee klatch, card games, exercise programs, potlucks, dances and many more. There is never a dull moment at Mission Bay. The large clubhouse features a main hall with adjoining kitchen, billiard room, card room, crafts room, living room with adjoining library, laundry room, and exercise rooms with saunas. A large swimming pool, covered spa, putting green and shuffleboard courts are located next to the clubhouse. The San Leandro transit system has a FLEX Shuttle bus stop inside the park. Within walking distance is a large senior center.